2nd Vice Pres. 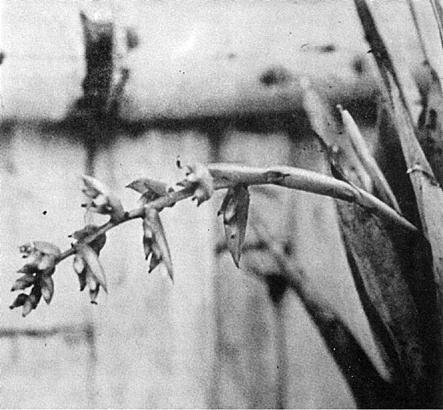 George Kalmbacher, N.Y.
Re-Evaluation of Dutch Boh "Brombloom"
Billbergia alfonsi-joannis Reitz — Photo by J. Padilla. The object of this collecting journey into South America was, firstly, tillandsias, in large enough quantities to be propagated in commercial quantities and, secondly, also cacti while I was there. As the main country to visit I therefore chose the Argentine as having more interesting and showy tillandsias in a comparatively smaller area than, for instance, Brazil, though the latter country has incomparably more other bromeliads. I arrived at Rio from Johannesburg on the direct flight at 2:30 p.m. and upon arrival was immediately conveyed by one of those ratty, smelly, mad taxis to the top of the legendary Corcovado where stands an old, rather imperious hotel, miles from downtown but ideal for collecting! The very next morning found me on the winding scenic roads which cut through the dense forest behind Rio, and barely yards from the hotel the incredibly rich epiphytic flora started. Bromeliads everywhere, rhipsalis and lepismium in profusion, every tree branch thick with fallen leaves, bird droppings, moss, etc., all making for a beautiful humus in which the epiphytes grow in such profusion that the shape of the tree branches is hardly recognizable. Rhipsalis hanging down in great curtains, hatiora showering down, ferns, orchids, you name it, it's there! There is only one thing wrong with a tree garden like that — 99 percent of those plants just cannot be reached, being mostly on unclimbable trees! It is in fact one of the most frustrating of experiences to stand in front of these epiphytic gardens, that is right, in front, since the mountain slopes are very steep, many treetops are actually at eye level, and to be totally unable to reach them. So I was reduced to the humble status of scraping off pickings on the tree trunks where I could reach them, and even on that level they were rich pickings indeed! In a short while, besides many other plants, I had collected from the trees, rocks beside the road and even the concrete balustrade beside the road: 3 aechmeas, 3 neoregelias, 2 tillandsias, 3 vrieseas, and others which are still just collecting numbers. The plants at this low "collectable" level were, however, almost all seedlings, both cacti as well as bromeliads; they seem to get to a certain size and then simply die for lack of adequate light. I also saw a number of cacti in great profusion on inaccessible vertical rock faces. It was just impossible to get at them without a helicopter. Most of the plants were growing out of large clusters of bromeliads, which cling like leeches to the smooth granite, giving the cacti as well as other flora (treeferns) a hold and at the same time enough decomposing matter to keep growing. Next to the road and on a large, bare boulder I found several square yards of the small (in this locality) Pitcairnia albiflos. Also growing next to the road and one of the few bromeliads which seemed to mature in deep shade was Vriesea carinata. A little farther on I saw Aechmea conifera, 6 feet in diameter but without a single offshoot. Those which had offshoots were high in the trees, out of reach! It seems incredible that a tree branch can support this plant which must weigh at least a hundredweight. Wandering a little off the road I came across a shady glade covered with a pale green, tubular leaved bromeliad. The leaves were rather soft — was it an aechmea, a nidularium, or a quesnelia? There was not a single old or new spike in sight despite the fact there were hundreds of plants. It must be one of those bromeliads which propagate mainly by stolons and rarely flower even in the wild. The trees had numerous large clusters of Neoregelia zonata, again all of them out of reach. Back on the road I found a small tree branch which had obviously fallen. 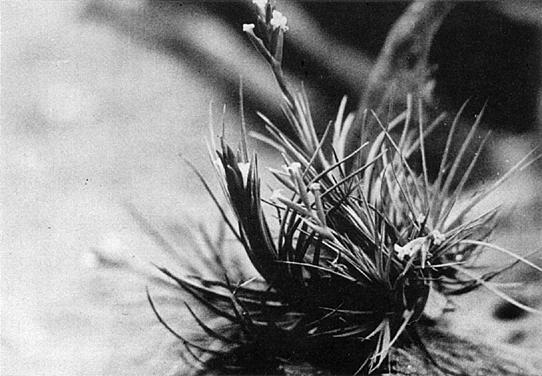 On this were 3 plants of Tillandsia geminiflora — the only plants of this species I was to see. Incredibly all 3 plants survived the 2 months' journey home and have just produced their first seed crop. The red spiked aechmea of medium size, which was the commonest bromeliad in that region, has not yet flowered, and I still do not know which species this is. Since I did not have any contacts in Brazil, I left the next day for Buenos Aires where I met Mr. Fescher, who was to accompany me on my collecting trip. After attending to a few odds and ends, we immediately set out towards Rosario and after that towards Cordoba, the entire way totally flat and equally uninspiring pampa, sodden and black near the La Plata and dry and gray farther inland. There are few sights more depressing! There was not a single cactus up to Cordoba, though on rare occasions I was able to collect Tillandsia recurvata, but nothing else. North of Cordoba the Chaco starts gradually, and about 75 km. north of the town we were able to gather some cacti and several tillandsias, among them the small, spiny leaved T. rectangula and the smaller T. tricholepis, the 1½-inch clusters growing on naked rock and even hanging underneath the rocks like so many Anacampseros, indeed the similarity between those is quite striking. 105 km. north of Cordoba we stopped among some low granite hills and on the little bare islands which were formed by rock outcrops and where the dense bush could not encroach too much we found Gymnocalycium quehlianum, but in much greater numbers the interesting pure white Tillandsia duratii, growing on bushes, on rocks, on the tall "Quebrachos" and the stetsonias, the leaf tips recurved and curled around every available hold, just like a monkey tail! Near the top of the hills I saw a large bromelia — its immense hedgehog-like thicket quite impenetrable. Also there were again T. duratii, as well as several other species. Gradually the bush became higher and the large, twisted quebracho hardwood more plentiful and occasionally we came through dense stands of a very, spiny leaved medium sized palm (Trithrinax campestris). Soon we crossed the northern end of the Salinas Grande, salt everywhere — the ground white crusted for hours on end. 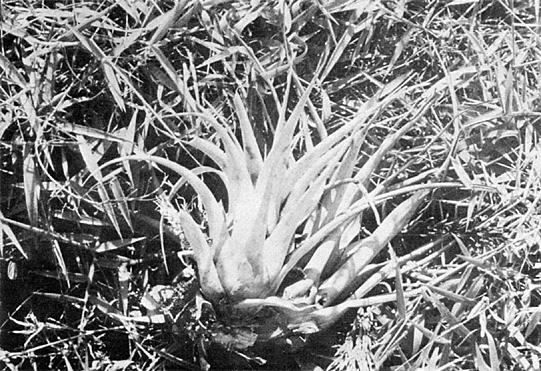 Growing among the low bushes were small clusters of the tiny Deinacanthon urbanianum, now Bromelia urbaniana. The plants were in a very shriveled condition, this being the end of the dry season. I took a few cuttings, but they did not survive the long journey home — a great pity because well grown this bromeliad would make a very nice addition to a collection. More Salinas and later on the Chaco again; towards evening we encountered terrific dust storms and later it began pouring cats and dogs and heaven knows what else. It was still raining when at midnight we arrived in Tucuman, and the streets there were raging torrents. Next morning the rain had subsided into that most miserable of all rains, a steady drizzle. However, not having any time to spare we pushed on and left Tucuman, driving through large cane fields and past telephone wires festooned with Tillandsia recurvata. Soon we turned off towards the mountains and on the road to Tafi de Valle. Tucuman gets more rain than either Salta in the north or Catamarca in the south, and the result is dense tropical rain forest on the slopes of the mountains to the west of the town. Soon we were among the first giant trees and despite the rain I was soon busy hooking plants off the branches. 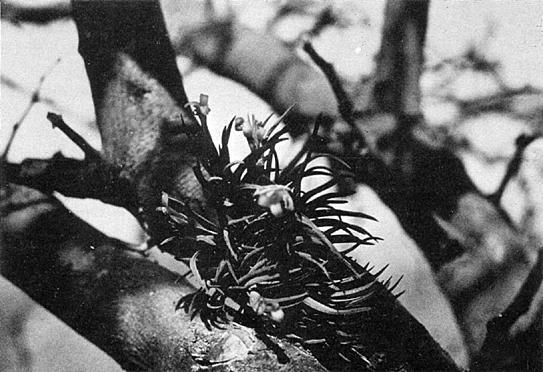 A surprisingly robust rhipsalis hung down with branches often 1.5 meters long. 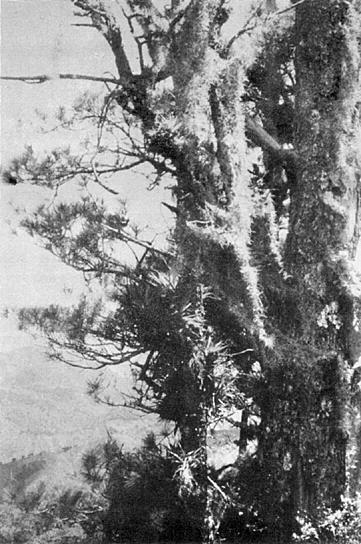 On the same branches were Tillandsia meridionalis, Vriesea friburgensis, and an unidentified aechmea. As we pushed on among the soggy wet trees, the road became steeper and at times so slippery to be almost impossible to negotiate. Occasionally I stopped to collect odd tillandsias and once was lucky to spy a flat leaved rhipsalis hanging down in single strands and T. lorentziana, a very welcome find as it was not at all plentiful. Gradually we noticed it was getting colder; we had left the tropical zone behind and had entered the ghostly looking cloud belt, with gnarled black trees, their branches grotesquely overgrown with lichen and mosses. Plentiful here were Tillandsia schreiteri and T. usneoides, the Spanish moss. Gradually the trees also disappeared and gave way to reeds, bamboo, and ferns. Finally at about 3000 meters altitude we came onto the plateau of Tafi de Valle. By this time I was soaked to the skin and shivering faster in the cold that I would have thought possible. Soon we approached the village of Tafi de Valle, and at the large hotel there we had an excellent lunch and some warmth in the form of gas heaters; in summer I believe this is a favored weekend spot, though in winter it was quite deserted. Nothing much came of our plans to collect because after driving towards the pass (which is 4000 meters), the rain finally changed to ice and the road became so slippery on the steep gradient that we got stuck hopelessly and had no alternative but to turn back and drive to Tucuman. Next morning we were at the Cadilalle dam just north of Tucuman and on the steep hillsides found a number of interesting cacti. A vertical rock nearby was covered with the silvery rosettes of Deuterocohnia schreiteri. On the thorn bushes I collected Tillandsia streptocarpa, T. unca, and T. ixioides, altogether a rewarding spot! A little further on we came through stands of tall, large trees and here I was able to collect some plants of the beautiful Tillandsia didisticha, the pendent, fan-shaped inflorescences full of tubular white flowers. The next day I spent packing the plants so far collected and sending them off to Buenos Aires. The day after we drove straight through Guemes-Salta-Jujuy up to the little Indian village of Uquia just south of Humahuaca. There we stayed with friends and talked until late at night. The next morning we set out for the mountains west of the village, and as we proceeded up a shallow river valley, I collected Tillandsia crocata as well as T. andicola; incredible that these plants can grow and flourish there on 50 mm. of rain a year! After lunch we drove south again ; at about 3000 meters and some km. north of Tilcara we stopped at a particularly promising mountain and started collecting there. In a shady gorge we came across two tillandsias, one the rare T. friesii, the other T. diaguitensis, an interesting species as the plants had no root at all but hang down in great cascades with only the tip alive, the old strands hard, brittle, and woody. Next morning we set out in the direction of Jujuy and along the road noted large expanses of abromeitiellas. At 23 km. north of Jujuy we turned off the road and into the rain forest which forms the foothills of the Andes, just as at Tucuman. Soon I was able to collect many Tillandsia tenuifolia, the narrow, grasslike and grass-green leaves sprouting brilliant pink-white inflorescences. We returned to the main road and just north of Jujuy we turned off again to Termas de Reyes where there is a luxury hotel built over hot springs. We had a magnificent supper though we looked rather like hoboes and though it was plain that the management disdained our rather soiled outfits, they certainly took our pesos quickly enough. We camped some way up the valley to be near the collecting spots next morning. The next day we drove through the biggish town of Jujuy, collecting various tillandsias as we went. About 15 km. south of the town we stopped, and investigating towards a small, deeply eroded stream came up with a most interesting find in the form of Puya (formerly Pitcairnia) mirabilis, the thin, graceful, bronzed leaves ending in a small bulb, the dead flower spikes 4 to 5 feet tall with very large, 3-inch seed capsules, all of them empty. The few plants I took from there all grew and within a few months produced their 4-inch, chartreuse flowers which are self fertile and produce literally millions of seeds, each one of which carries the potential of a flowering plant within 3 years. This was indeed an excellent find and one which should not be missing from any rockery since it makes a very unusual and graceful addition. From there to Salta was more or less a non event except for the ever present tillandsias, which I collected now and then. At Salta, a fairly large town, we spent the night and next day took the first road to the east which comes out below the railway bridge on the Rio Mojotoro. Some 12 km out of town we stopped and collected some cacti. Further on we descended towards the river, which however proved fairly strong flowing, a great pity since on the other side and unreachable were great masses of the huge Tillandsia maxima, visible for miles, and to this day I can kick myself for not having forded the river because I have not managed to obtain this species elsewhere. So I contented myself with the side of the river I was on and collected some small plants of Deuterocohnia schreiteri, which were simply everywhere in large mounds, nice silvery white. Farther on, on nearly inaccessible steep walls were many large clumps of Abromeitiella brevifolia, of which I collected a good many. Back at Tucuman I packed the plants on to a train towards Buenos Aires, and then we carried on towards Catamarca through a quick succession of varying landscapes, cane fields, scrub, and twisted our way up the tortuous Cuesta da Tortoral. There in vertical rock faces I found a large, pale pink flowered form of the stiff leaved Tillandsia unca. In this area I also found T. ixioides, T. gilliesii, and T. capillaris. Then down towards Catamarca where we arrived after dark. Next morning we went off to the large town dam some km. northwest of Catamarca. The rather open savannah-like landscape was thickly festooned with various tillandsias, which included T. rectangula, T. duratii, T. funebris, and T. capillaris. Needless to say, I collected my fill. From here we drove south through an increasingly dry landscape and eventually came to the little town of Sanagasta where I collected some of the most massive Tillandsia duratii I had seen, fully 50 cm. tall and all of them growing on bare rock in an area receiving less than 10 inches of rain. Because time was running out we continued to drive south towards the Sierra de Cordoba. Unfortunately we soon came to realize that the entire Sierra de Cordoba is a favorite resort area and very densely built up. We went on to Cordoba, the day after to return to Buenos Aires. Here there were several crates of plants awaiting unpacking which I had railed from various points and these needed sorting and repacking for the long sea journey. 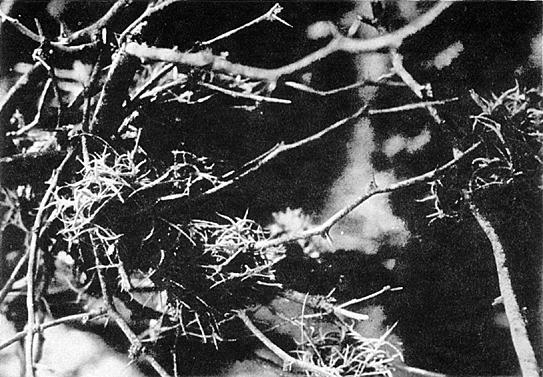 For this I had two days' time before hopping on the train for Chile, but this is another story . . . .
(For a detailed account of the cacti collected, the reader is referred to the Cactus and Succulent Journal for January—February, 1974, from which the above article is taken. All members are invited to the ANNUAL DINNER of the Society to be held on September 4 at Brookside Country Club, Pasadena, California. Guest speaker will be Dr. Werner Rauh, who will show his beautiful slides on Ecuador. 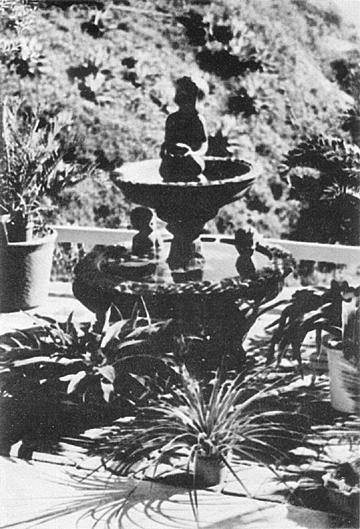 Reservations may be had from Mrs. Jeanne Woodbury, 1811 Edgecliffe Road, Los Angeles, Ca. 90016, by sending in check for $7.50 per person. 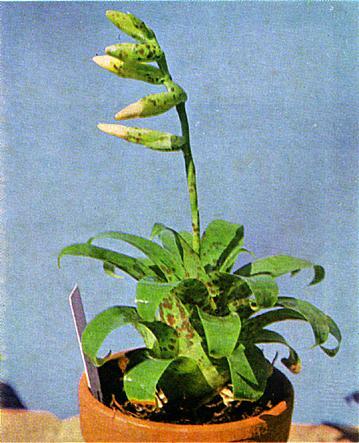 Having used the same bottle of the Dutch BOH (beta-hydroxyethylhydrazine) bloom stimulant BROMBLOOM for 6½ years, I can confirm the tentative evaluation made in my article on the subject in the Bromeliad Society Bulletin (Jan.-Feb., 1969, Vol. 19, No. 1) that BROMBLOOM is remarkably stable and effective. When used accurately, with the proper procedures, it can produce inflorescence in 85% of the treatments. Since then I have treated 110 bromeliads with BROMBLOOM and have obtained flowering in 88 of these plants. In the past 1½ years I have improved the percentage of successes to about 85% with an alkaline procedure described here later on. 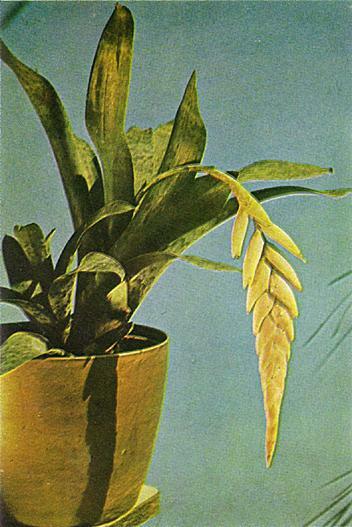 Included in the failures were a number of immature plants as well as such notoriously difficult bloomers as Aechmea pectinata, Vriesea fosteriana and V. fenestralis. In the case of the latter two vrieseas, I am certain that the problem was lack of sufficient maturity as they were only 2½ years old and not nearly big enough to pop. I did manage to flower another shy bloomer — a 20-month old Quesnelia arvensis. Most of the plants treated were 2 to 2½ years old, but many, such as Aechmea dealbata, A. × 'Foster's Favorite', A. pineliana var. minuta, Billbergia × 'Fantasia', B. pyramidalis, Guzmania musaica, G. zahnii, Neoregelia carolinae var. tricolor and Nidularium innocentii var. lineatum, responded when 14 to 18 months old. For apartment growers, with typical shortage of growing space, being able to bloom a bromeliad before it reaches full size is a valuable asset, especially since indoor growth tends to have greater foliar spread as a result of lower light availability. The BROMBLOOM should be stored tightly closed and dark. By using a pipette or syringe to draw out of the bottle only such amounts as were needed, I have kept my concentrate untainted for 6½ years. With reasonably accurate measurements as to strength and quantity of solution, not a single plant was damaged. Plants which failed to infloresce kept growing normally. To measure accurately, you will need a graduated cylinder of at least 15 milliliter (c. c.) capacity and a graduated 1 ml. syringe or pipette. Step 1 — Drain all water from the plant. This can best be done by hanging the plant upside down for at least 15 minutes with the pot rim hooked over the bathtub side or on a faucet. Be sure to first stuff the top of the pot with newspaper to keep the mix from spilling out. Step 3 — With a graduated pipette or syringe, draw out the proper amount of BROMBLOOM from the bottle (e.g., ½ ml. for Vriesea splendens) and add to the water in the cylinder. Step 4 — Pour solution into the cup of the bromeliad. After 3 days, add plain water to the cup to avoid possible burning of the center, should total evaporation of the solution take place. When the BOH concentrate is mixed with the water, an ethylene gas is released which triggers the development of inflorescence in bromeliads. The pH of the water will affect the amount of gas released. The December 23, 1967 issue of the British science publication, NATURE, reported a fascinating study on the influence of pH on the effectiveness of BOH in causing abscission in citrus. It was found that water with an alkaline pH of 8.5 released 10 times more ethylene gas from the BOH than did water with an acid 4.3 pH. I therefore recently attempted to contain the gas with the following experiment: I took several small tillandsias (stricta, araujei, aeranthos and myosura) mounted on cork or tree fern plaques and placed them in clear plastic utility bags. I then poured 15 ml. alkalized solutions of BOH (of from .5 to .75 ml. strength) over the plants, quickly blew up the bags and twisted the tops tight around the necks of the wire hangers attached to the cork or tree fern, and tied the bags with twist 'em ties. The excess of the solution collected at the bottom of the bags, which were adjusted so that the plants were not sitting in the solution. 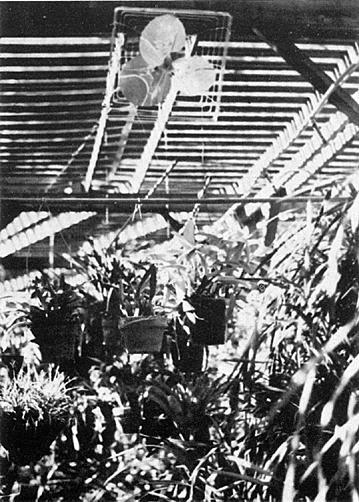 The blown up bags with plants were then returned to their window hanging places and were kept there for 4 days after which time the bags and solution were discarded. 3 of the 4 plants bloomed within 9 to 10 weeks, a highly significant result despite the limited number of plants involved. I believe it likely that the prolonged exposure of these plants to the ethylene gas contained within the plastic bags was responsible for this success. For those interested in displaying bromeliads at shows or competitions, data on the time required from BOH treatment to full bloom for the different species would be invaluable. Absent large scale testing, however, such data may be misleading. Depending on the vigor of their growth and the time of the year, I have had as much as a month's difference in the blooming of different plants of the same species. Generally, treatment in the spring and summer produces blooms 1 or 2 weeks sooner than winter applications, because of the increased temperatures and light. Billbergia inflorescences mature the quickest — 5 weeks on average; feather type inflorescences as Tillandsia lindenii and Vriesea × 'Mariae' take from 4 to 5 months for the bracts to color up and the flowers to open. Aechmeas, guzmanias, neoregelias and nidulariums usually need 3 months. BROMBLOOM is made by ACF Chemiefarma NV, P.O. Box 5, Straatweg 2, Maarssen, Holland, at a cost to you including air parcel post shipment of 31.3 Netherland guilders, or about $11.50 per 250 ml. bottle. If the shipment gets hit by Customs, there may be an additional nominal charge. Tillandsia bourgaei in the lath house. I have been collecting and caring for bromeliads in southern California for the past twenty years. My present home is in the Hollywood hills, covering approximately 2½ acres, the land being mostly hilly terrain with some level areas; the soil is decomposed granite. The temperature is mild, rarely going to 32 degrees in winter, with an average of 50 to 55 degrees. In the summer the average is 75 to 78 degrees, rarely exceeding 100 degrees. I grow my bromeliads everywhere — under lath, in the greenhouse, on the terrace, on the hillside, in the open area around the pool in full sun — wherever there is room. In the lath area I have incorporated a 30 percent plastic type shade covering, which helps protect the plants. Here I have also recently installed a system of fans in the event of frost. When the air temperature drops to 34 degrees, the fans start to operate. However, this past year, the fans have been utilized only once. The fan system can also be used in the hot summer months to promote air circulation. Under lath I grow many of the tillandsias which I personally collected in Oaxaca and Chiapas, Mexico, during the past year. These include T. concolor, argentea, plumosa, makoyana, violacea, prodigiosa, magnusiana, juncea, seleriana, macdougallii, oaxacana, and many, many more. Here I also grow many bromeliads I collected in Brazil two years ago: T. stricta, T. geminiflora, T. gardneri, T. paleacea, along with many species of aechmea, neoregelia, nidularium, and vriesea. In addition to the shade area, I am growing many Brazilian, Peruvian, and Mexican tillandsias in another area of the property in full sun. These plants have been especially selected to be able to withstand the southern California climate and its variant temperatures. Also, in this same sunny area I have some neoregelias, mostly of the marmorata type, some aechmeas, nidulariums and three unnamed species of vriesea from Brazil. These sun located plants are misted twice a day in the summer and 2 to 3 times weekly in the winter. There is a mist type sprinkling system installed throughout the entire property. The winter watering schedule depends on the amount of natural rainfall during these months. Many of my plants are in clay pots, potted in hapuu; however, most of the tillandsias are mounted on slabs or driftwood. Some are installed on pieces of cork of various sizes, while most of my small tillandsias are wired onto plastic coated welded wire which is fashioned into the shape of cylinders. All plants collected or purchased during the winter are usually kept in the greenhouse until March, especially when the elevation of the plant is not known. After March, these plants are moved outside permanently. There has been some plant burn on some of the outside sun plants, but very little frost damage; and, all in all, I believe that I am getting better color and better growth with the intense natural sunlight. Mexican tillandsia from Chiapas growing on sunny terrace. Neoregelia marmorata growing in full sun. In the lath house, showing one of several fans. The fans are slanted downward to move the warm air. I have planted many neoregelias, species and hybrids, on a hillside some 75 feet from the house. This is a hilly area with decomposed granite as the soil base. In most cases, these plants have already bloomed and the pups removed and potted. The original mother plant is then planted on the hillside right in the ground and in 6 to 7 months a new set of pups develops. The mother plant then dies and is discarded. Watering on this hilly area is done by means of 360-degree rain bird type sprinklers. No frost protection is required, as there are several small shrubs and trees on the hill that afford some protection from the cold and the intense heat. However, many of the marmorata type neoregelias are planted in the full sun without protection of any kind. In this same sunny spot, but located in a flat area adjacent to the swimming pool, is a large driftwood tree mounted with gray leaved Mexican tillandsias and a few neoregelias. These plants have been mounted by use of a clear silicone glue and nylon stockings cut into strips to help attach the plant to the branches. The entire watering system throughout the property is manually operated. The fertilization of my plants is done as follows: I fertilize once a month with the COMMANDER PROPORTIONER having an injector ratio of 1:128 I do not fertilize during November, December, January, and February. In March and April fertilization is done using a PETERS MIXTURE of 18-18-18; i.e. 18 percent nitrogen (N), 18 percent phosphoric acid (P205), 18 percent potash (K20), with one part calcium nitrate added to the above mixture. In May, June, July, and August, I fertilize the same as in the previous months except no calcium nitrate is utilized. In September and October I fertilize with PETERS MIXTURE 9-14-15 with one part sulfate of potash added. This fertilization schedule was suggested by Charles Wiley, a successful grower, after much research on his part. I am also using a reverse osmosis watering system which also was recommended by Mr. Wiley and installed by him. His watering system manufactures approximately 80 gallons of water per day, with a 250-gallon reserve tank. This water is used in the green house and is also used in about one half of the outside areas. This water is supposed to be as close to pure rain water as is possible to manufacture. This watering system has been in operation for the past 8 months, and I am now starting to see great results — the plants are in superior condition and the color is greatly improved. I have also found that it is easier to root seedlings with the aid of the reverse osmosis water. A small to medium-sized plant with dull, leathery foliage that is bluish green with maroon spots. The pale pink inflorescence has yellow flowers. Easy to grow and hardy outdoors in California. Vriesea rodigasiana is a dainty, dwarf species with soft, light green leaves. 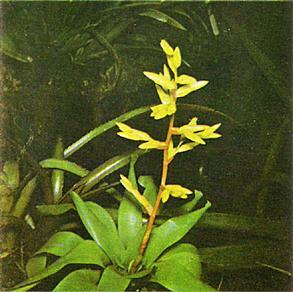 The inflorescence which does not exceed one foot is slightly arched and bears yellow flowers. Does best in the greenhouse. Vriesea platynema — A highly decorative plant, variable in size, with attractive bluish green leaves that are faintly marked with wavy lines, that have purplish tinting on the underside, and purplish tips. A shy bloomer. Vriesea racinae is probably the smallest of the genus, usually about 4 to 10 inches in diameter. It is not easy to grow and to flower, needs greenhouse care. It has offsets on sides and in center. The plant in the photo is in a 3-inch pot. Perhaps you are wondering why anyone would write an article praising Billbergia pyramidalis. Of course it's a billbergia — with all that implies — and yes, it's a very common one. But stop and think — do you have many bromeliads which flower more faithfully, or that are as hardy, or as prolific at offsetting, or as beautiful? When anyone asks me what my favorite bromeliad is, I quickly answer that one is Billbergia pyramidalis. 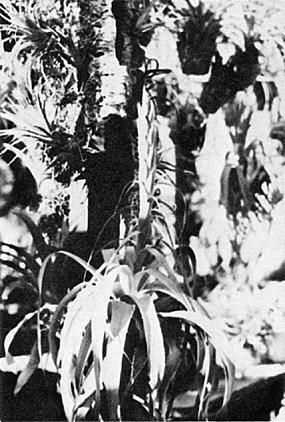 Anthony said that he came "to bury Caesar, not to praise him", but I want to praise Billbergia pyramidalis and not see it buried under the avalanche of new hybrids and weird bigenerics. With the development and introduction of so many hybrids and with so much emphasis put on the more sophisticated bromeliads these days, we have become somewhat jaded in our outlook toward the common and plentiful species, particularly the billbergias. This, I believe, is a mistake and we should take a closer look at some of these slighted plants. Old friends sometimes prove to be more reliable. As noted above, Billbergia pyramidalis is a dependable plant both as to inflorescence and hardiness. And even though it shares the common fault of its flower being short-lived with the other members of its genus, for this short span, like a sunset, it is a thing of beauty. Unlike the typical tubular shape of the billbergias, this species is a spreading vase shaped plant of a soft spring green color. The undersides of the wide leaves often have a few faint whitish cross-bands. There are usually about a dozen of these slightly spined blunt tipped leaves. Its inflorescence is an upright cluster of blossoms and bracts of a rose color which is difficult to describe; it is not quite red, not rose, and certainly not pink. It is rather the shade of some exotic lipstick color and might be ballyhooed by advertisers as "Temptation Pink", "Tahitian Sunset" or "Moon Dawn". The bright iridescent flower head flaunted so proudly above this living vase might well be described by quoting the poet Gerald Manley Hopkins, "It will flame out, like shining from shook foil; It gathers to a greatness". It doesn't really seem too important that this beautiful bromeliad was found in Brazil as long ago as 1822 for it has adapted so easily to all kinds of locations and situations that we no longer think of it as an "exotic" plant. It thrives when mounted on wood or potted in all sorts of mixtures (yes, even plain "dirt"). It can be found growing in greenhouses, outdoors in mild areas of Florida and California or enhancing a spot near a window or on a table in the home. It is common, and maligned, and a billbergia, but it is easy to grow and beautiful to look at. There are three varieties of this interesting bromeliad. 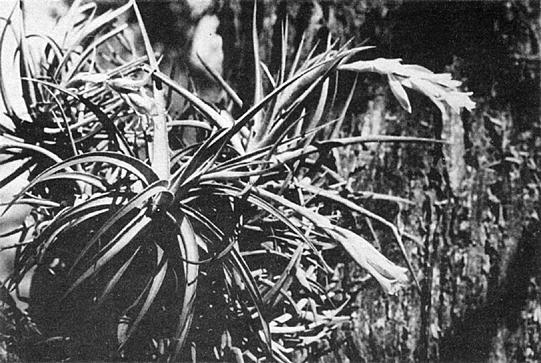 Billbergia pyramidalis var. concolor with flower petals and bracts of that one lovely uniform color, Billbergia pyramidalis var. pyramidalis with a touch of blue on the petals and Billbergia pyramidalis var. striata which is a fine variegated form. The usual time of flowering of Billbergia pyramidalis is in the late summer here in Texas but, like people, individual plants have their idiosyncrasies and it occasionally blooms at off times. However, there is also a winter flowering variety of this billbergia. The variegated form (var. striata) appears to be a variety of this winter blooming plant. Billbergia pyramidalis will "grow" in almost any light conditions but when grown in the proper light (average) and not too crowded, its wide leaves create a truly lovely spreading vase shape. To me, this shape alone would make it an interesting and valuable addition for anyone interested in plants. But those floppy, loppy, long-leaved specimens you see sometimes would certainly not endear it to anyone. Billbergia pyramidalis also makes an excellent "watchdog". That annoying small black fly-spect scale seems to appear first on this bromeliad. So by watching this billbergia closely, the presence of this scale can be detected quickly and steps taken to eliminate it before the insects can spread to other plants. This hardy bromeliad is often used by hybridizers and is one of the parents of Billbergia × 'Fantasia' (Bill. saundersii × Bill. pyramidalis), Billbergia × 'Henry Teuscher' (Bill. pyramidalis var. concolor × Bill. venezuelana), and Billbergia × 'Jenischiana' (Bill. morelii × Bill. pyramidalis) to mention a few. It carried many of its fine traits to these new creations. So this has been a sort of testimonial to Billbergia pyramidalis, a good friend in the plant world. Let's hear it now for this good faithful friend. Come on: Hip!, Hip!, —! As a result of my trip to the Dominican Republic, I decided to compile a list of all the bromeliads now known to exist in that country. I have been corresponding with my host there, Luis Ariza Julia, who is the only person there who has a complete grasp of the bromeliad flora of the Dominican Republic. He has been giving me information based on his notes and experiences, and a number of letters have passed back and forth with questions and answers. I have the two volumes that comprise the flora of the Dominican Republic, one done some time ago (1943) by R. M. Moscoso, Catalogus Florae Domingensis, and the Supplement #1 by Dr. Jose de Jesus Jimenez. 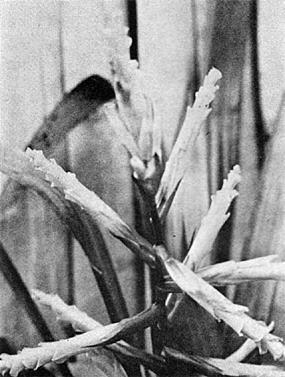 Luis' list should be the same as the resultant entries in the same two books, if there were no errors in them, but it develops that in the original a mess appears in the genus Pitcairnia, which goes to show the confusion that existed at that time in that genus. The listing of all Dominican species entailed some research on my part, but it is Luis' knowledge that is of special importance. This resume with notation of errors, so that anyone in possession of the original Flora can make corrections is presented herewith through the pages of the Journal of the Bromeliad Society. One of the things that had me wondering was that Tillandsia rubra had been reported only once. Was it a misidentification or had it become extinct? The record rests in a specimen collected by Dr. Richard A. Howard, Director of the Arnold Arboretum. Luis has this explanation: The location where it was found is so difficult of access, that no one has ventured to see what else can be found about its numbers. It would seem that this feat entitles Dr. Howard admission to the Explorers Club! This makes a total of 54 described species, but with the four undescribed taxa in the Pitcairnias, any one of which might be a new species, the number of species may be more. Pitcairnia tomentosa Hortl. ex F. G. Dietr. Pitcairnia angustifolia is also entered, but is of no significance as it lists only Haiti incidence with no reference to any location in the Dominican Republic. 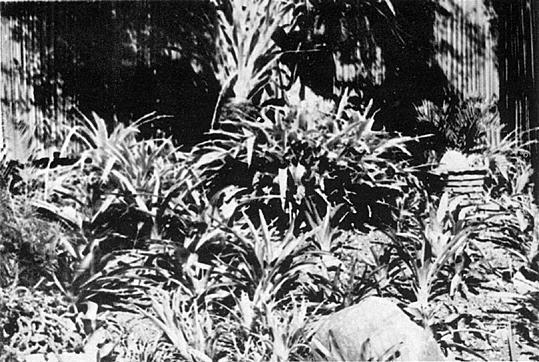 Note that one of the plants is named after Prof. Moscoso, a tillandsia, that a tillandsia is named after Luis Ariza Julia and that Dr. Jimenez has a pitcairnia named after him. One of the plants I had brought back with me is a Till. paniculata. After a short period the beginnings of an inflorescence were discernible, and as it grew up to its two and a half foot maximum the large bracts that covered the stem were a sort of chestnut color, quite dark. I sent a colored slide to Luis and this intrigued him because, as he wrote me, he had a number of specimens of this species and his analogous bracts were all light green. It is apparently a new form. 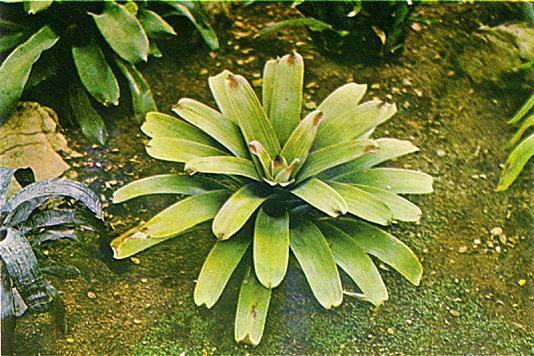 Although bromeliads are very tenacious of life, they cannot do their best on air and water only, and usually simply stand still when deprived of adequate nutrition. It has been definitely proven that the effects of artificial feeding are always beneficial and often dramatic. 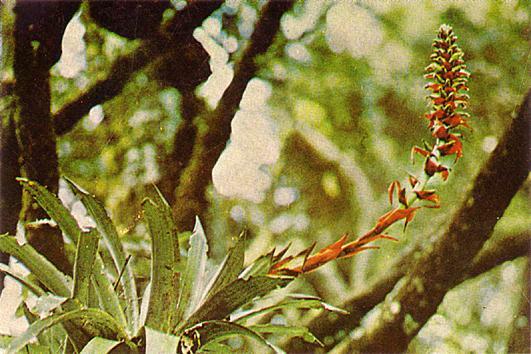 In the natural state, purely epiphytic bromeliads subsist almost entirely by the absorption of gas in the forms of carbon dioxide and ammonia, and dissolved organic material falling upon them. This natural feeding goes on more or less continuously according to the amount of rainfall or fog condensation during evening and early morning. Those species and varieties which possess water-holding abilities depend less upon gas absorption and more upon drawing in digested and dissolved organic matter which has fallen upon them and has become lodged in the leaf axils. This organic material is in the form of bird manure, twigs and leaves, air borne ash and dust, dead insects and other small animals. 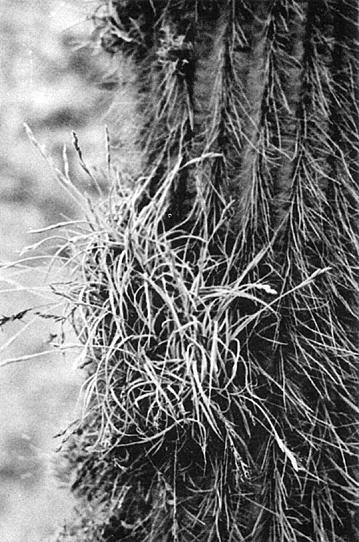 The roots of terrestrial bromeliads also do absorb nutrients, but this activity varies with different species. A collection of many different bromeliads growing in a greenhouse must, for the sake of efficiency and economy, be fed in the same way with the same material; therefore a compromise diet must be found that will satisfy most kinds. This can be accomplished quite satisfactorily by placing the plants in their proper natural relationships to each other, or as some call it, stratification. This is, in descending order, small purely epiphytic tillandsias highest, tank tillandsias next, then rough aechmeas, tender aechmeas, vrieseas and guzmanias next lower and nidulariums lowest of all. 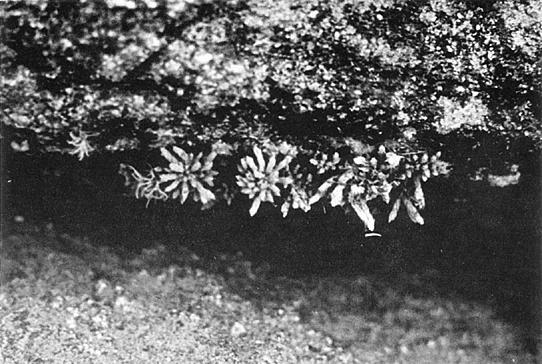 When feeding material is sprayed on plants arranged in this fashion, any excess drips off those above onto those below so that little material is lost. It has been found that a completely dissolving chemical fertilizer roughly of 10% nitrogen, 5% phosphates and 5% potash works best when alternated every other week with a brew of liquid sheep manure. Both kinds must be used very judiciously and sparingly. Use only one feeding of either material per week. Most prepared, completely soluble orchid fertilizers give very satisfactory results when one-half the concentration recommended for orchids is used. The sheep manure brew is made by placing ten pounds of commercial dried sheep manure in a 25-gallon covered tub or other container and filled with water. Allow mixture to stand for a week before use. Resulting liquid when ready for spraying will be about the color of strong tea and all solid matter will have settled to the bottom. Use this liquid diluted again one part to ten parts water. Both of these liquid feeds are best applied by hand with a trombone bucket sprayer for smaller collections of plants. Power sprayers may be used for large plantings. It is not advisable to run corrosive fertilizer mixtures through automatic mist systems, as clogging of mist-heads will eventually result. Open natural gas burners and small unvented kerosene burners used for heating in greenhouses give off large quantities of carbon dioxide gas which is absorbed by the bromeliads in growth processes. This in addition to liquid feeding often produces phenomenal results. Better coloration, larger plants, more rapid propagation, timely flowering, and that robust and handsome health so much admired by all who grow plants, will be the rewards of any good supplemental feeding program faithfully attended to. It is well worth the extra effort to feed bromeliads because the results are always so gratifying. Billbergia alfonsi-joannis Reitz is shown on the cover just coming into bloom. The editor raised it from seed received from Dr. Reitz, and it took about ten years to come into flower as it was grown outdoors without any special care. It is a large plant, with medium dull green leaves, faintly marked, that are over 2 feet long and about 3 inches wide. 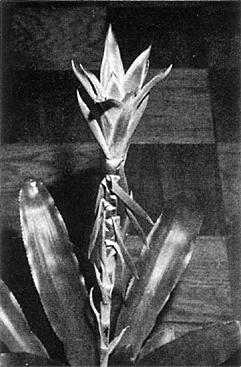 The inflorescence was 18 inches in length, with bracts that measured 8 inches by 2¾ inches. The petals were 2 inches long, and the stamens 1 inch. In all, it is about the largest billbergia that the editor has flowered, and about the most beautiful. The editor regrets that the affiliated organizations do not appraise her of coming shows and other events in time to get them into the appropriate issues of the Journal. It would be appreciated if such happenings could be in her hands if possible at the beginning of the year, so that a calendar could be set up. Members are urged to set aside the first weeks of June, 1975, for the 25th Anniversary Celebration to be staged in Orange County, California. Preparations are under way to make it an outstanding occasion. Watch future issues for schedule, accommodations, etc. All photographs and slides sent to the Editor are at the owner's risk, as the Society cannot be responsible if they become lost. It is suggested that only duplicates be sent. One night as I had my feet up looking over what must without a doubt be one of the most beautiful river systems in Australia — The Hawkesbury — I was noting what a truly magnificent sunset it was that night combined with a peace and beauty that is unusual, if not rare, in this "Zip, Zip" age, when up wandered an old timer, who sat down, made himself at home, lit his favorite pipe and grumbled "Beats the City Life, doesn't it?" Agreeing with him on this point, we then lapsed into our own worlds for ten minutes and silence settled, parting only for the odd mosquito. The sun in its final nightly curtain bow, bathed the trees, water and mountains in a breathtaking orange, intertwined with splashes of burnished gold and finally gave up and let dusk settle — and with this conversation resumed. The old feller had lived on the River for the best part of his life and knew it, its people, flora and fauna like we know our own families, and almost at once the conversation swung to fishing. Fishing in one form or another was his life and love, but as we talked deeper into the oncreeping shadows, he revealed that he was a very ardent gardener and when I mentioned that I had earlier that day admired his almost unbelievable array of bromeliads, did the conversation eventually completely evolve around them. I had found his weak spot and he showed it. He told me that they had a special overall and personal significance to him, as his wife who had died some two years earlier, had chosen one hundred of them in various forms to adorn the church when they had wed some fifty years earlier, and he reckoned that a good fishing year always followed a large flush of flowers and offshoots. His complete display which he later allowed me to view was one that would make a tropical grower gasp; the size, color and beauty was simply incredible. As he continued on, I plied him with questions on how he attained such a magnificent overall result, and at long last the secret came out. His house was situated just below Wiseman's Ferry, which is the agreed point at which the fresh and salt water mix and meet, and as such he gathered from the river bank compost which the tides had deposited over the years—usually from the back of the bamboo reeds, which grow thickly in parts; these in turn had deposited their own form of compost and being continually damp the resultant mixture was a compost so rich it made your mouth water, and this he said was his secret preparation combined with a light "Zest." That was all, no other fertilizer — but plants were split and repotted each two/three years. I asked him whether he had ever exhibited his work, and the only comment was "I was lucky enough to win a couple" and that was it. Probing a few of the other residents later in the week brought forth the news that he had over the years, and not only with bromeliads, taken well over 500 prizes in one form of gardening or another. Needless to say, the next day I was down on the river edge shoveling up my first bag of compost, and in twelve months' time I'll let you know the results. (Reprinted from The Spine, October, 1973). It was recently stated in our newsletter that we take for granted information which appears to need no further investigation. Such is the case with Tillandsia usneoides only having roots when in the seedling stage and thereafter dispensing with roots entirely. 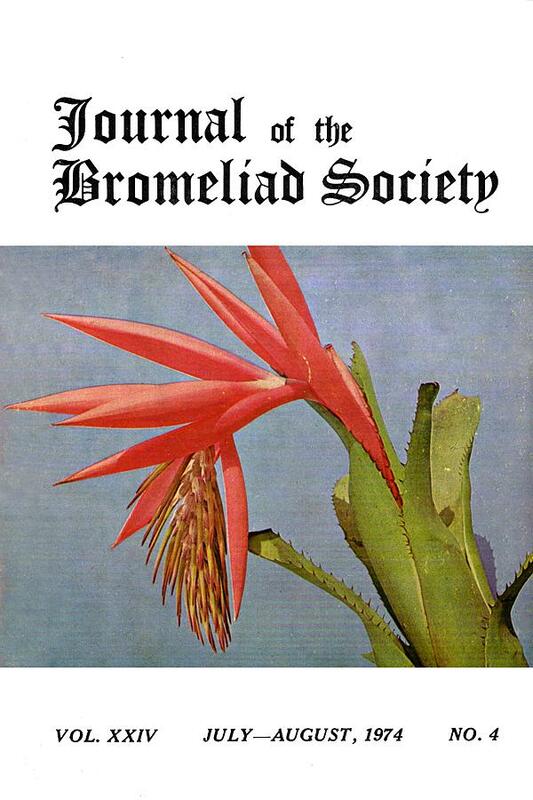 Even Dr. Werner Rauh (Bromeliad Society Journal, Vol. XXIII, No. 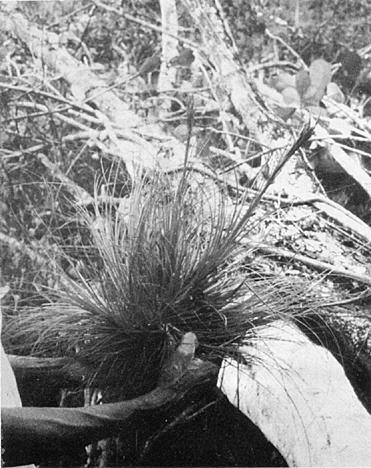 3, p. 89) makes the statement "Some bromeliads are completely rootless, as is the case of the widespread Tillandsia usneoides, which hangs in long thick strands from trees, rock walls, and even telephone wires." Bromeliad growers have accepted this statement to such an extent that nobody examines his "Spanish Moss" minutely. I also took this for granted until I closely looked over material that was being packed in an order. Little cream colored threads attracted my attention. They measured from half an inch to an inch and a half inches long, and in a six-inch ball of T. usneoides I found about twelve little roots. On looking at other clusters of T. usneoides growing out of doors, as well as in the shade house, I found that all had little roots showing, as well as an odd flower. Plants growing outside showed the same root growth as those growing in the covered shade house. Perhaps it is the Queensland climate agreeing with these plants that have been transplanted from the temperate climate of Thornleigh, New South Wales, but in the past I have sent many strands of T. usneoides interstate and have never heard anyone say it has produced roots for him. It will be interesting to watch and see if the root growth remains or if it will reappear with the summer rains and high humidity next year. In August of 1973 I went for a five-week trip to Ecuador to see the country and to collect bromeliads. It was my first trip to South America, and I was filled with enthusiasm to find so many fine bromeliads that I had never seen in Europe. With my brother, who lives in Ecuador, I traveled for five weeks by car throughout the country and collected many plants which I sent home to my nursery in Germany. We were told that the old road from Quito to St. Domingo abounds in interesting bromeliads, and so we started early one morning to drive along this road. As we did not know this area, it was not easy to find this road, because people always directed us to a newer and better road which everyone took. But at last we found the old road, and although it was in bad condition at the beginning, it finally got better. My brother drove while I looked for bromeliads. Suddenly I saw about 20 meters high in a tree a clump of bromeliads, the leaves shining in the sun. It appeared to have white leaves. I cried to my brother — "Stop, stop!" And we went back and I sent him up the hill to see if the bromeliad was a special one. I could not climb because I had hurt my hand with a machete some days before. Half an hour latter my brother brought a clump of bromeliads back with four variegated offshoots. This bromeliad grows in this area on many trees but is always green. The variegated plant I found nowhere else but on the old Quito-St. Domingo road, 42 km from Quito. I think it is a form of Tillandsia tetrantha. It was growing at a rather high altitude where the nights are very cool. Dr. Rauh writes in his book about the different types of T. tetrantha, and notes that culture is difficult. I have a plant in our nursery where it is not too warm at night, but it is growing very slowly and I do not know whether I will be able to keep it. We continued on our drive and about 50 km later I found a wonderful Guzmania. The plant with its bloom had fallen from the tree, but as it was raining very hard I was not able to find another plant of this variety. We carried this plant, together with others we had collected, for about ten days before we shipped them to Germany. Unhappily this unusually nice plant died about three weeks later. Does any know this plant? THE BROMELIAD ROUND ROBIN is flying high again, thanks to the fine efforts of Mrs. Velva Jane Watson, 8615 Jackson Springs Road, Tampa, Florida 33615. All interested members should contact her directly. If you have not visited Costa Rica and gone to the top of Mt. Irazu, the volcano that a few years ago created such havoc to the surrounding countryside, you have probably never seen Vriesea irazuensis (Mez & Werckle) Sm. & Pitt. This bromeliad is an example of a species that does not like to live anywhere except at elevations of approximately 9,000 feet in the cloud forests that occur near the summit of this volcano. Even Charles Lankester, who lived on the Meseta Central at about 5,000 feet, was unable to grow it successfully. In the full sun, the foliage becomes a brilliant red (see the cover of the Journal for Sept.-Oct., 1964), a color which is soon lost as the plant is brought to lower elevations. 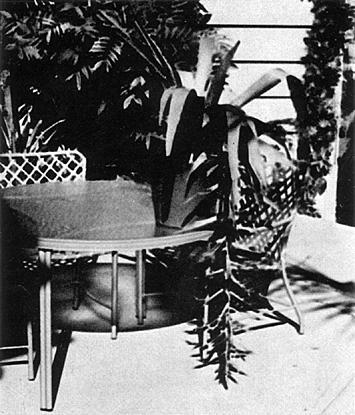 Even though the plant has a hardy appearance and the foliage appears to be tough, it has been this author's experience that it will not tolerate shipping. This is too bad, for it would be a handsome addition to any collection. It is almost worth the trip to Costa Rica to see this beautiful vriesea in its native habitat.